Uckfield is a small town that offers plenty of history and culture. The most fascinating part of the town is perhaps Church Street, which is home to many historical buildings, including Bakers Cottage and the Old Grammar School. Uckfield’s history can be explored at Bridge Cottage, which is the town’s oldest building. Uckfield is situated on the River Uck and has been used as the main setting in many novels. The town has gained much interest due to its myths and mysteries, including the story of Nan Tuck’s Ghost. It also attracts many visitors due to its selection of shops and monthly farmers’ market. The town is the location of several major festivals, including the Uckfield Festival. In addition to its ancient building and selection of shops, Uckfield is also surrounded by many nature reserves. The town’s interesting history combined with its surrounding woodland and modern amenities make it an ideal location for a special event. The town offers a traditional setting and there is no better way to celebrate a special event in this location than with some great traditional British food. A hog roast is the perfect accompaniment to any event in Uckfield. Taste the Cracklin will provide you with everything you need to make your event special. If you are looking for a catering option that is quick, affordable and delicious, then a it is the perfect solution. It’s also ideal for those in need of something that will provide their guests with plenty of tasty food throughout the day or evening. Taste the Cracklin will enable you to experience the delights of a hog roast in a great location. You can enjoy the sight and appetising aroma of the meat as it roasts and be provided with a catering option that is not only affordable but also entertaining. It is a great way to create a cosy, inviting atmosphere for your guests and with you acting as a hog roast chef for the day, you are sure to impress. It’s suitable for any type of event. Whether you are planning a gathering with family and friends, a party with your work colleagues, a festival or a wedding, it will also help to add something extra to your special day. It provides warm, delicious food for an outdoor event or gourmet food for a sit-down meal. It is an extremely versatile type of catering, which means that you do not need to worry about it being unsuitable for your event. Our menus can be designed to suit your needs. You do not have to be limited to just the meat. You can enjoy hog roast rolls and sandwiches with tasty, sweet apple sauce and crackling or a hog roast dinner with all the trimmings. You can even select a different type of meat such as beef, turkey or chicken if you prefer. There is also a selection of tasty vegetables and salads to add a bit of variety to your meal. Taste the Cracklin is the perfect way to celebrate the town’s fascinating history. You can explore the town’s ancient buildings and the myths and mysteries surrounding it whilst tucking into tasty hog roast sandwiches or a hearty dinner. A location such as Uckfield is the perfect place to enjoy the appetising aroma and mouth-watering flavours of a hog roast. We’re also the perfect option for individuals or companies that wish to provide something really special for their guests for the day. 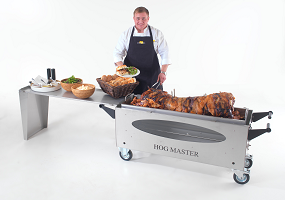 Whether you are an individual planning a small family gathering or a pub or restaurant wishing looking for an ideal catering option for an outdoor event, a hog roast machine will provide you with everything you need to make your event more memorable. If you wish to be provided with a hassle-free catering option that enables you to enjoy great food and the company of your guests, then you can have your hog roast cooked and served to your guests for you. It provides a plentiful meal, making it the perfect option for those in need of something suitable for a large number of guests. You and your guests can be provided with succulent meat and tasty side dishes throughout the day or evening. Whatever your requirements, whether you need a machine for the day or require a hog roast caterer to cook and serve your meat, it will provide you with everything you need to make your event in truly special.